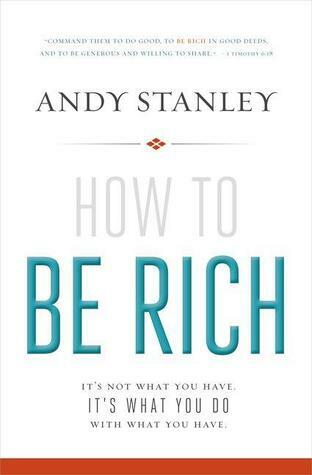 Review: How To Be Rich Book&DVD Study by:Andy Stanley | A Simple Life,really?! How to Be Rich: A DVD Study is a small group Bible study from pastor Andy Stanley exploring 1 Timothy 6:18. Andy biblically redefines what wealth is, how to use it, and helps you and your group practice being rich so you will be good at it if you should ever be so fortunate. The early Christians took this command seriously. Generosity was the hallmark of the early church. They did for those who could not do or would not do anything in return. That was new. That got people’s attention. Is that how people in our communities would describe us? This small group study is a tool that will force conversation and reflection around the topic of what to do with what we have. Jesus could not have been any clearer. It’s not what you have that matters. It’s what you do with what you have that will count for you or against you in the kingdom of heaven. Andy will encourage you and your group to look at richness differently, which might just lead our families, communities, and world to looking at Christians differently. Andy Stanley is the founder of North Point Ministries, Inc. (NPM). Each Sunday, more than 33,000 people attend one of NPM’s seven Atlanta-area churches. In addition, NPM has planted over 25 churches outside the metro Atlanta area with a combined weekly attendance of more than 15,000. Over one million of Andy’s messages are accessed from our North Point websites monthly, including both leadership and sermon content. To learn more and to access our free online resources, visit us at http://www.northpointministries.org. As Americans especially, we are constantly bombarded for the need of “more”–wanting more, needing more. But as Andy Stanley is pointing out, we may already be rich and not realize it. Jesus throughout the New Testament pointed out that it wasn’t about having more as much as it was about what we do with it. Early Christians took 1 Timothy 6:18 to a whole other level that we have clearly overlooked in our fast paced world. I know for myself and my family times are really hard right now. And then I reason with myself and say if I just had a little more money, I wouldn’t be so worried about paying bills and buying food. But as the author points out even when we get to a point to where we have enough, we stop and quit doing things for God. After all we have everything now, what do we need Him for at this moment. I know for my husband and I, we pray that we remain humble. And yes we realize that asking God for that could prove to be a difficult time of growth for us, but I would rather remain humble that turn into someone that loses touch with the hardships are me that need to be addressed. **Disclosure** This book was sent to me free of charge for my honest review from Book Look.